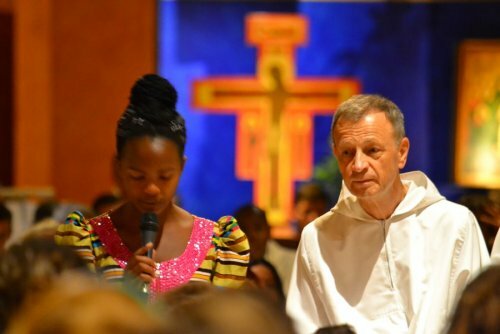 These days in Taizé are special, with this program of workshops and round-tables made possible by the presence of so many guest speakers involved in various areas. The wide range of topics, the depth of the exchanges and the participation of all of you make this week a beautiful event of this summer on the hill. For my part, I returned from Hong Kong, where, with about ten brothers, we had a meeting with 2,500 young people, the seventh Asian stage of our pilgrimage of trust. Words are too weak to convey the intensity of what we experienced. Many Asian countries were represented, including many young people from mainland China—it was beyond all our hopes. Our songs were translated into different Asian languages. A deep sense of unity marked the meeting, true unity in the great diversity of this continent, where Christians are often a minority. We need to pray for these young Christians in Asia. By the pilgrimage of trust on earth that Brother Roger initiated forty years ago, we want to participate in creating trust between peoples, between Churches and even between different religions. The next stages will be in Madrid, at the end of December, for the next European meeting; in Beirut, Lebanon, next March; in Cape Town, South Africa, in September 2019. In a few minutes I will give the floor to Amanda, a young South African volunteer. Through prayer, reflection and sharing, we try in each of the gatherings of the pilgrimage of trust to go together to the wellsprings of joy. This was also the topic that I wanted to develop in the four proposals formulated for the year 2018. I would like to speak to you about this now. Faced with the great challenges that our time is going through, we often find it difficult to remain joyful. Sometimes being joyful may even seem out of step—when so many people experience suffering and when ecological threats become dramatic, some people wonder: is joy an appropriate attitude? For us Christians, this gift is shared in a life of communion and in praise sung together. Through common prayer, a personal relationship with God and a communion between those who are gathered together are created at the same time. A sensitivity to joy is awakened by the beauty of certain events, remarkable encounters, lasting friendships, by artistic creation or by the beauty of nature. But it also comes from within: it comes in particular from the love which is shown to us and which gives birth to a happiness that gradually fills the depths of the soul. Then, little by little, we can better understand that joy is not a kind of exaggerated sentimentality, nor an individualistic happiness that leads to isolation, but the peaceful assurance that life has meaning. Far from an exaltation by which we run away from the problems of our time, it makes us even more sensitive to the distress of others. When it is rooted in our innermost being, inner joy does not weaken solidarity with others; it nourishes it. It even stimulates us to cross borders to join those undergoing difficulties. It keeps alive in us the perseverance to remain faithful in a life-commitment. When we become aware of the love that God has for each of us, we find new courage to widen our friendship to include all those entrusted to us and in particular to those who are most vulnerable. In this way, many people devote their lives to children, the sick, the excluded or migrants. If our communities, our parishes, our youth groups, could become more and more places of goodness of heart and of trust! Places where we welcome each other, where we seek to understand and support each other, places where we are attentive to the weakest, to those who are not in our circle, to those who are poorer than us. Throughout this week, you have been asking yourselves about the wellsprings of joy and the great challenges of our time. This week of reflection for 18-35 year olds has now become a tradition, so I’m happy to invite you today to take part in the next week of this kind next summer, from August 25 to September 1, 2019. Finally, I would like to share with you some good news. Saturday evening, during the common prayer, we will welcome a new brother. His name is Yohan, he comes from Indonesia and he will now continue his journey to follow Christ in our community. His country is currently severely affected by violent earthquakes in one of the many islands of the archipelago. With the young people gathered in Hong Kong, we prayed for the victims and their families in mourning. I would like to say to the Indonesians currently in Taizé: we continue to pray these days for your country. And now Amanda, from South Africa, will speak to us. Good evening everyone! My name is Amanda, I’m from South Africa. I am 24 years old. I have been here in Taize for three months as a volunteer. It has been a great experience and I wish I can take this back to my country, living together in peace as a community regardless of our skin colors and languages. Although South Africa is a beautiful country there is a lot of segregation, a huge gap between the poor and the rich, whites, coloreds and blacks. Racism still exists—in black communities we are squashed together, living in small houses and living in informal settlements, having no privacy and very limited access to resources. But I also want to add that there are also white people who stand in solidarity with us to defend our rights. The Church also has challenges, young people do not feel useful in the Church—we feel like we are not trusted with any responsibility. There were also cases where the Church was taking too much from the people instead of giving; this was covered a lot by the media. But the good thing about South Africa is that we see issues and address them, because we all want to live a fair and an equal life in peace. There are conversations which have started about land expropriation without compensation; we are hoping for good results. We are a diverse country, yet such a beautiful one. I hereby invite you to join us in the Taizé meeting that will take place next year in September. Your presence will be really appreciated. There will be an opportunity to come and join us four days before the meeting, to live with the local communities and learn about the beauty and difference of cultures in South Africa. Welcome!